(NASHVILLE, Tenn./BOSTON, Mass. — Aug 2nd, 2017) A story of resilience and a dream resulted in the epic anthem “Solid Ground” by singer/songwriter Rebecca Correia. The song, produced by Grammy-winning artist Keb’ Mo,’ and the stunning music video are scheduled for release in August. This is an incredible collaboration of music, lyric and dance inspired by a Boston marathon survivor Adrianne Haslet and created with the intention of helping many others. Kind of Blue Music CEO Robbie Brooks Moore, whose label is releasing the project, said “Solid Ground” honors the very human journey of overcoming great obstacles while offering hope and inspiration to others. “We are so proud to be a part of this project Rebecca envisioned and to which Adrianne graciously said yes. When we can support a worthy cause through the creation of great art, everyone wins,” Moore said. Ultimately, 50 percent of the song proceeds will support Limbs For Life Foundation. – Haslet is a board member and ambassador. Limbs for Life is a global nonprofit organization dedicated to providing fully functional prosthetic care for individuals who cannot otherwise afford it and raising awareness of the challenges facing amputees. Splitting her time between Nashville and the Boston area, Correia is a classically trained musician who weaves a beautiful blend of Americana, Country and Blues with a dash of Pop into her over 200 works. She co-wrote the song “So Long Goodbye” with three-time Grammy-winner Keb’ Mo.’ The song is on his album, “BluesAmericana,” which was GRAMMY nominated for Best Americana Album in 2015. A runner and Boston area native, Correia first followed Haslet on Instagram (www.instagram.com/adriannehaslet) where her story and passion for dance have been chronicled. Correia collaborated with videographer Rob Ranney on the “Solid Ground” video. The duo had previously produced the highly acclaimed video “Oh, Nashville” which earned an International Portuguese Music Award for Best Music Video in 2015. For more information, visit www.kindofbluemusic.com or www.facebook.com/rebeccacorreiamusic/. 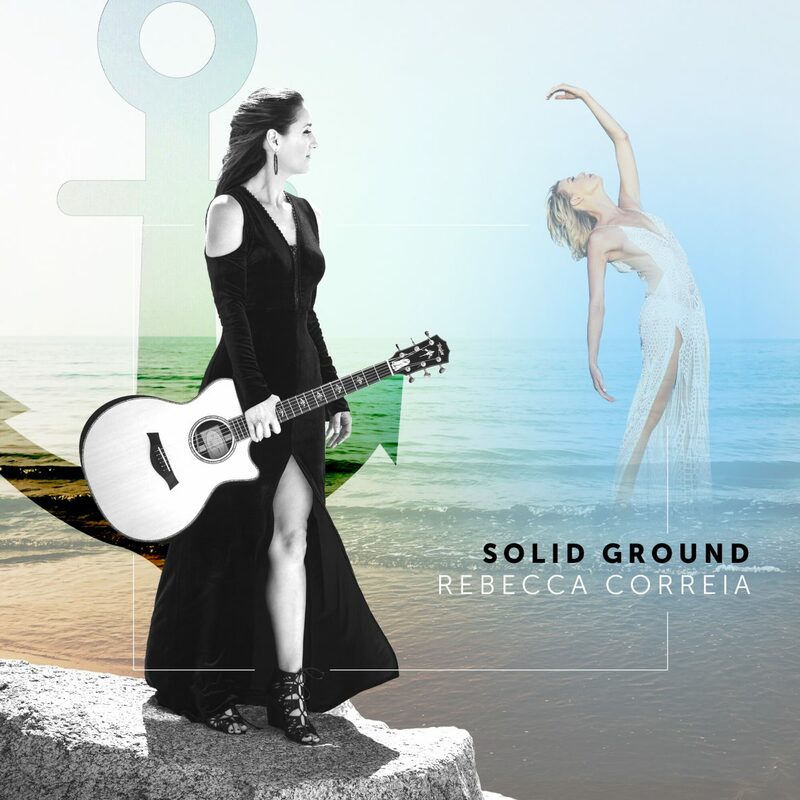 On August 4, the single “Solid Ground” will be available for pre-sale and Correia will be the musical headliner for The Feast of the Blessed Sacrament, the world’s largest Portuguese Feast, in New Bedford, Massachusetts. She’ll be performing with a special appearance by Javier Colon and a sneak peek of the “Solid Ground” video. The official release date of the single and music video is August 23 by Kind of Blue Music and available on all digital outlets including iTunes and Amazon. On August 23, at 2 p.m./3 p.m. CDT/EDT, Keb’ Mo’ will be hosting a Facebook Live on his page and introducing Correia and Haslet for a live appearance and viewer questions. On August 24, an official “Solid Ground” single release and video premiere party and performance takes place at 7:30 p.m. EDT with a special performance by Haslet at the Zeiterion Theatre, 684 Purchase Street, New Bedford, MA (02740). Kind of Blue Music’s motto is “Quality Music Kind Mission.” They seek to give back with every project and have previously partnered with the world-renowned Playing For Change Foundation to support music education and the TurnAround Arts Program started under the leadership of Michelle Obama and continued on through the Kennedy Center for the Arts. For more information, visit kindofbluemusic.com.